The state of California has seen an increase in frequency and size of wild fires, including historic brushfires in the city of Los Angeles such as the La Tuna, Creek, and Skirball fires. Additionally, smaller brushfires have been accidentally started by well intentioned residents performing brush clearance. Therefore, Los Angeles City Council has approved an ordinance to increase requirements for brush clearance and fire safety in the Very High Fire Hazard Severity Zones (VHFHSZ). This ordinance establishes appropriate safety measures necessary to mitigate the occurrence of such fires. Brush clearance cannot be done on red flag days, when fire weather conditions are at their peak. Individuals engaged in brush clearance operations shall not engage in any other activities during their actual clearance of grass or brush. An approved fire extinguisher, or a pressurized garden hose with attached nozzle shall be within 10 feet of any grass or brush clearance operation, to quickly extinguish a small fire before it burns out of control. Read the full Ordinance here. It is effective now. 1. Areas within 200 feet of structures and/or 10 feet of roadside surfaces or combustible fence: Grass shall be cut to three inches in height. Native brush shall be reduced in quantity to three inches in height. 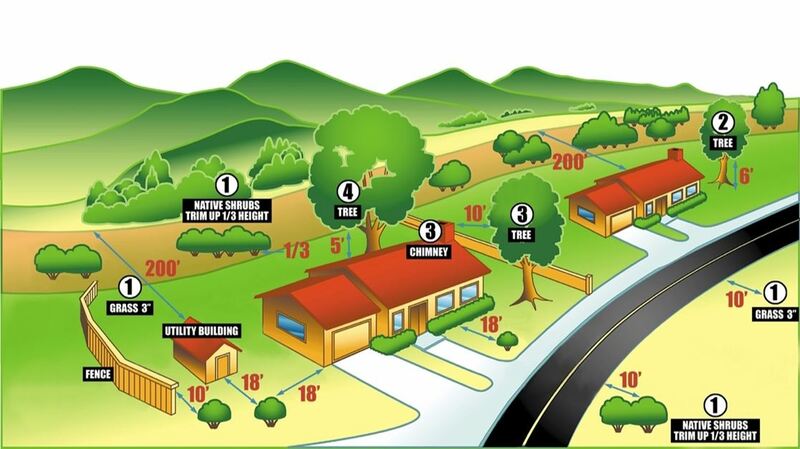 This does not apply to individual native shrubs spaced a minimum of 18 feet apart, provided such shrubs are trimmed up from the ground to 1/3 of their height with all dead material being removed (see diagram below). 2. For trees taller than 18 feet, trim lower branches so no foliage is within six feet of the ground, and remove all dead material. For trees and shrubs less than 18 feet, remove lower branches to 1/3 of their height, and remove all dead material (see diagram below). 3. Trees shall be trimmed up so the foliage is no closer than 10 feet from the outlet of a chimney (see diagram below). 4. All roof surfaces shall be maintained free of substantial accumulation of leaves, needles, twigs and any other combustible matter. Maintain five feet of vertical clearance between roof surfaces and portions of overhanging trees (see diagram below).